QUIETUS has been in the wild for a month now, and a number of reviews are in. I'm intensely thrilled to see my novel's name in so many of the places it's appeared. There may have been a tear or two! "The US writer burst on to the SF scene this year with a stunning novel about an extraterrestrial who has arrived in 14th-century Italy to study the black death. The juxtaposition of alien and human cultures at the heart of Quietus allows Palmgren to ask a host of knotty philosophical questions, as well as to tell an emotionally affecting story." "Habidah is an appealing, intelligent heroine, and the intricate story effectively tackles big themes such as free will and mortality, but Palmgren’s impeccably built, immersive setting of plague-era Italy is more accessible than the complex elements of the multiverse. Readers looking for something exciting from a promising new voice will find Palmgren’s debut worth their time." "Palmgren’s virtues as a writer are evident from page one. First off, he creates a cast of utterly rounded characters, Habidah first and foremost. Her reluctance ever to return to her home is just one of the engaging tidbits about her. These ultra-sophisticated, nearly posthuman Unity folks (they are laced with “demiorganic” implants and ridealong NAIs) are the endpoint essences of thousands of years of culture. (The Unity has been around for fifteen millennia.) Yet their motives and emotions remain relatable. Niccolucio and his fellow natives exhibit a completely believable mentality for this historical 1400s as we know that era. And when you put the two types together, the cognitive dissonance is enchanting. As for the rich setting: not to spoil anything, I hope, but I can say that over eighty percent of the book takes place on the planet, and thus we are almost reading a historical novel insofar as Palmgren seeks to recreates this period. And indeed, he succeeds with gusto. From the misery and stinks to the faith and art, he conjures up a vivid representation. (A subplot involving the Avignon papacy and Meloku is intriguing.) When the book does shift to a more high-tech venue, the author unleashes a gosh-wow torrent of van-Vogtian superscience and enigmatic strategies." QUIETUS is available at all the retailers on the left of this page and more. 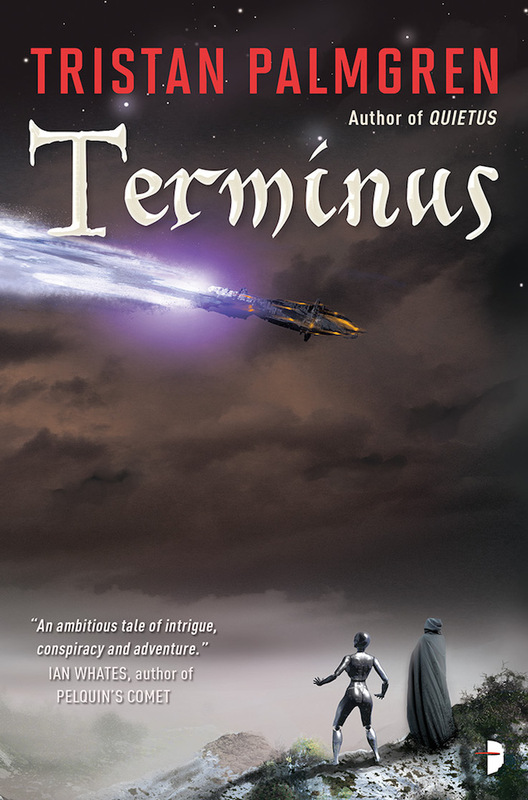 TERMINUS will be out this November. I've had the chance to interview with some wonderful people, not only about QUIETUS and its release this month, but also about my life and my writing. Links and highlights! "TQ: In Quietus who was the easiest character to write and why? The hardest and why? Tristan: I thought Niccoluccio would be my biggest challenge, as there were so many details about monastic life that I felt I had to get right. The anthropologists, though they come from a different universe, were deliberately given a "modern" perspective, and so I thought their voices would come a little more easily. But Niccoluccio and I turned out to be after broadly the same things in life. The most challenging character to write for was one of the anthropologists on Habidah's team, Meloku. Meloku is the most alien of Quietus's viewpoint characters. She's been living with an AI companion inside her head for years, embedded in her thoughts, and that's shaped her in all the worst ways you can imagine. She's not cruel, but she is cold in a way that I found difficult to write while maintaining reasons to care about her. The key to unlocking her turned out to be her anger. She's a very angry person, though she does not acknowledge that. She has fair reason to be angry." 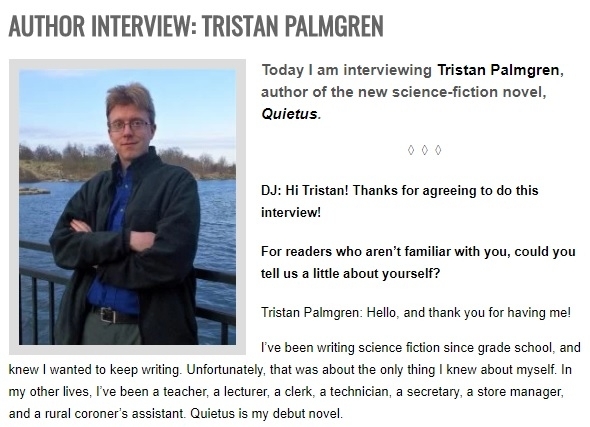 DJ: Did you have a particular goal when you began writing Quietus? Was there a particular message or meaning you are hoping to get across when readers finish it? Or is there perhaps a certain theme to the story? Tristan: I’ve always been entranced by alternate history, but less recently by What-If scenarios, and more by alternate history’s power to make history seem alive. Kim Stanley Robinson’s The Years of Rice and Salt lit a fire under me. It’s easy to look ahead and see an array of possibilities. But when we look back, history starts to seem like just a linear sequence of events. It feels constrained. We can’t pretend that we don’t know the outcomes. Alternate history, speculative history, robs us of that certainty, and helps us understand the choices people made without the benefit of hindsight. 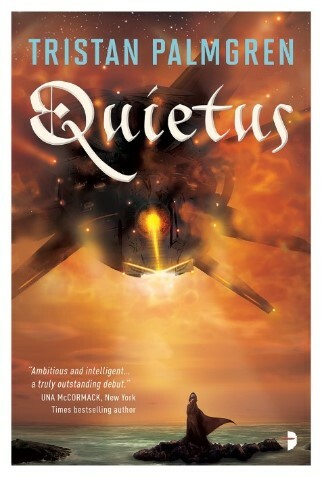 Quietus is not alternate history, or secret history, but it fits on the same shelf. I wanted readers to approach the Black Death without the certainty that hindsight brings. The certainties that Habidah and her anthropologists bring do not help them in the slightest. Elaine: Niccolucio, the monk, is a very interesting and appropriate character because of the way he fitted into the developing storyline. I got the sense that Niccolucio may have been the driving force behind the creation of the novel. Tristan: He popped up first. He actually has a real-life counterpart of brother Gherardo who was also a Carthusian monk. He was the sole survivor of his monastery. He was alone in the monastery for several months during a hard winter with only his dogs for company. Obviously, his life then took a different course to Niccolucio’s, but he immediately stood out to me the moment I read his story and I knew I wanted to include that story in my writing. It’s not just knowing the events of history that spoil things for me, either. It’s our worldview: everything we know and think we know about things like the age of the Earth, astronomy, geology, religion, and more. I can pretend not to know these things, but that’s all it is: a pretense. It’s always there, and it’s always going to be a barrier to understanding a historical novel’s characters and their crises. I wrote Quietus to foreground that problem. Dr Habidah Shen and her team of extradimensional anthropologists have come, for desperate reasons of their own, to Europe in the 1340s to witness the Black Death. Habidah knows her biases are a problem. She tries to, but can’t, surmount them. Thank you to everyone who lent me their space to write and speak! Over at the Barnes & Noble Sci-Fi And Fantasy blog, you can find a reveal I've been sitting on for a while and am tremendously excited about--TERMINUS, the sequel to QUIETUS, will be coming out from Angry Robot Books on November 6 of this year! The description spoils some of the end of QUIETUS. Fair warning! The transdimensional empire, the Unity, has dissolved. Its rulers and agents have been exiled, stranded across a thousand planes of existence. Empires don’t die gladly. The living planarship Ways and Means has ended the Black Death ravaging medieval Europe, but it has bigger plans for Earth. Someone is trying to kill former Unity agent Osia. Spy-turned-anthropologist Meloku becomes a target, too, when she catches the planarship hiding the extent of its meddling. While they fight to survive, Fiametta—Italian soldier, mercenary, and heretical preacher—raises an army and a religious revolt, aiming to split her world in half. You can preorder it at Barnes & Noble and all of the usual suspects. And if you haven't read QUIETUS, you can do that right now! On March 1st, QUIETUS released in the UK. Today, the contagion crossed the ocean and washed ashore in North America. This book has been an intense journey. I've gone from being buried under research, to scribbling a draft during unpaid time in the company break room, to taking it the throes of editing and publication. I'm proud to be able to share it, and grateful for the help, support, and faith of the Angry Robot team. "Habidah is a refreshing heroine in a genre that often seems overfilled with one-note examples of “strong women.” Her intellectual curiosity and doggedness are her superpower, strong enough to make those behind a conspiracy consider her a danger, even when she’s only able to track down half the answers. She faces the constant self-doubt, yet never fails to follow through and asks the hard questions when her suspicions are raised—even when doing so is tantamount to a death sentence." "Intelligent and engaging from the start, carefully conceived as both an intimate character study and a grandly epic adventure. Like its wonderful cover it seems to emerge from the mist, bathed in warm light, while its scale is terrifyingly sublime." There's more to come. I'll be doing a round of interviews, podcasts, and blog posts, and I'll be sure to collect them here. You can find QUIETUS at Amazon, Barnes & Noble, and many other retailers--and of course on Angry Robot's e-shop. Between day-to-day work, preparing for QUIETUS's impending release (two and a half weeks! ), and digging into revisions for upcoming project, the past few weeks have kept me busy. I have plenty to share, though, and will have more soon. Over at Goodreads, you can enter a giveaway to win a free copy of QUIETUS! 15 copies are headed out into the world, for free, and you can get a chance at one just by clicking a button. I cannot PROMISE that Goodreads will prioritize entries made sooner rather than later, or confirm that that is even how the system works at all, but... you know... it never hurts to enter early. If you will be at the Emerald City Comic Con, February 28-March 4th, come drop by the Angry Robot booth. You will be able to find me and several other Angry Robot authors there. I'll be attending the Thursday and Friday of the con, and will graciously and magnanimously accept any drinks you offer to buy me. I will be flying to Seattle for the con. It has been years since I have last flown, but I'm sure things have only improved since then. The experience of air travel must have hit its nadir at some point. Right?